For over 30 years, Frameworks Gallery has displayed a wide variety of artistic media - oil and acrylic paintings, pottery and raku, watercolors and lithographs, pastels, etchings and studio glass vases - all in a warm and friendly atmosphere. Frameworks Gallery is known for showing the latest original art in the Southeast. They introduce novice art buyers to the process of collecting fine art of all mediums and styles (oil, acrylic, watercolor, mixed media, pastels, giclee, photography, abstract, landscape, portrait, still life, pottery, sculpture, blown glass and more). 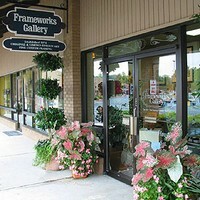 Parking: Frameworks Gallery is located in East Cobb, in the Woodlawn Square Shopping Center, next door to Fresh Market. Free parking is available.